Swifts breeding in our study area have mostly gone – there seemed to be major overnight departures on Tuesday 1st and Saturday 5th August but a few remained over Chesterton until 12th August. Since then occasional birds are probably over-flying migrants moving south but about 10 were feeding with swallows over Midsummer Common on 20th August. Two pairs used the Swift Tower on Logan’s Meadow and at least 10 nest boxes on Edgecombe Flats, near Campkin Road, were occupied. A Chiffchaff, singing in Huntingdon Road on 12th August, was probably a passage bird confused by a spring-like sunny day. August is wader passage time. Overflying night migrants that often call include Whimbrels, Godwits and Green Sandpipers. On a clear night listen for their contact calls especially if the prevailing winds are from the north or east. An examination of prey from Peregrine Falcons nesting in Nottingham found the remains of night migrants such as Water Rails, Nightjars and waders. The two pairs of nesting Peregrines in our project area both reared two young. One of the young from the City centre crash landed in Caius College and spent five days R&R at the Raptor Foundation near St Ives. It was then successfully reunited with its parents in the City. Our project has four new surveys and we are asking for records. One of these surveys is for Tawny Owl records. From August young Tawnies are ejected from parental territories and attempt to set up their own home patch. They can fetch up in any wooded area, including our gardens, especially if near open ground where they can hunt small mammals and earthworms – Tawny Owls are great worm eaters! The “tuwit too- wooo” is an amalgam of the female call – “tuwit” or better a sharp “kerwick” and the male call – “ too-whoo”. There is a breeding pair with well fledged young in Sidgewick Avenue. Please send Tawny Owl records to nathistcam@gmail.com or to me at the email the address below giving date, location – street name. 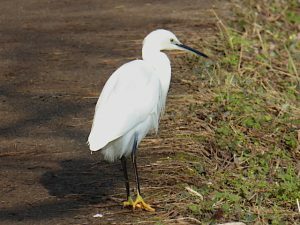 All records will be confidential and also forwarded to the County Bird Recorder. Another raptor common in the City is the Sparrow hawk. A male was displaying over Logan’s Meadow Chesterton at the beginning of August – why? Probably, like the Chiffchaff, inspired by a warm day rather than a late nesting attempt. 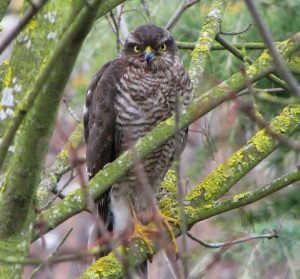 Sparrowhawks were our commonest raptor until 1960 but agricultural pesticide poisoning caused them to become extinct in Cambridgeshire for 25 years until a nesting pair was discovered in a wood in the west of the County in 1985. Since then numbers have recovered and now they are probably as common as they ever were. It is difficult to estimate their current population in our project area but it is possibly 10-15 breeding pairs. Future bird projects in our study area will include, (Grey) Herons, Little Egrets and wintering thrushes: Redwings and Fieldfares. Redwings will be with us very soon – early birds arrive on the coast at the beginning of September. Redwings are frequent night migrants and can be heard passing overhead with a high, drawn out, “seep” contact call.